Step 1 Trim or snap tough bottom ends off the asparagus spears. With a peeler, peel the bottom portion of each of the spears. Step 2 Put the asparagus in a large skillet. Add enough water to cover. Bring to a boil. Reduce to a simmer and cook until spears are just tender, about 5 to 7 minutes. Drain and keep warm. Step 3Combine the olive oil, minced anchovy, chopped parsley, shallots, lemon juice, fleur de sel (or Maldon salt) and a pinch of ground white pepper, or to taste. Step 4Drizzle half the dressing over the hard-cooked eggs and lightly toss with a fork. 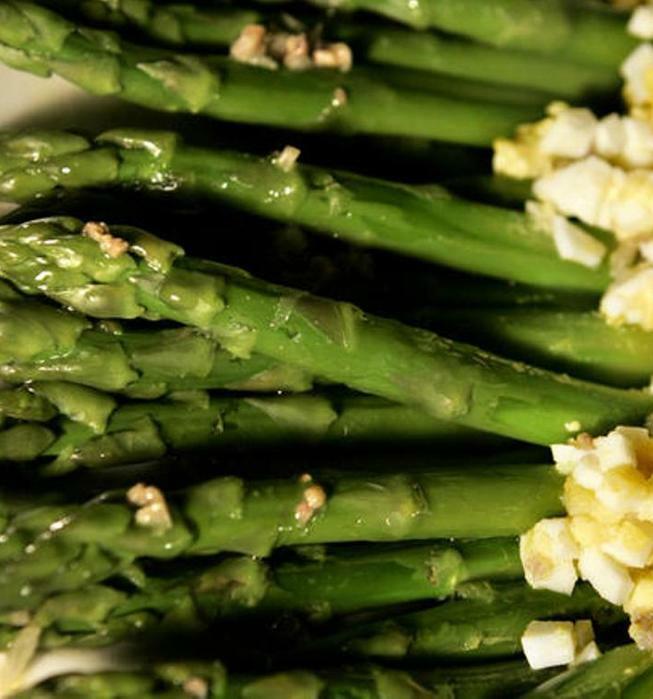 Arrange the asparagus spears on a serving platter. Spoon the egg over the cooked asparagus spears. Step 5Drizzle remaining dressing over the asparagus. Sprinkle chopped parsley over the top to finish. In Recipes-list.com we have selected the most viewed recipes from category - Fish and shellfish Vegetables . Enjoy the best recipes specially selected for you! Asparagus with egg and anchovy is the right choice that will satisfy all your claims.